The 2008 Jackson $1 Coin and Medal Set contains strike honoring the seventh President of the United States Andrew Jackson. Typically, these sets also honor the spouses of the former Presidents. However, as Andrew Jackson’s wife passed away a few months before he took office, she did not serve as First Lady. The authorizing legislation for the coins (Presidential Coin Act of 2005) made provisions for occurrences like this – an image of Liberty will be used instead. 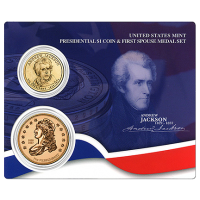 As such, the Jackson $1 Coin and Medal Set contains an uncirculated Andrew Jackson Presidential $1 Coin and a bronze medal replica of Jackson’s Liberty First Spouse Gold Coin. If a President was married to more than one person during their administration, each wife will be featured on a separate coin. This will result in more than four Spouse related strikes being issued in that given year. The Andrew Jackson Presidential $1 Coin and the Jackson’s Liberty Bronze Medal are each mounted on a plastic card imprinted with a colorful image of Jackson. 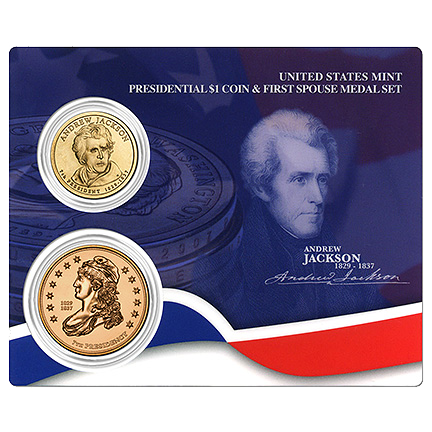 The United States Mint released the Jackson Coin and Medal Set on September 23, 2008. $7.95 is listed as the release price for the Jackson Set. Joel Iskowitz designed the portrait of Andrew Jackson that is featured on the obverse (heads side) of his Presidential $1 Coin. It was sculpted by Jim Licaretz. The reverse (tails side) features an image of the Statue of Liberty as designed and sculpted by Don Everhart. The obverse of the Jackson’s Liberty First Spouse Medal shows an image of Liberty that was originally found on the Capped Bust, Lettered Edge Half-Dollar coin from 1807–1836. It was the design work of United States Mint Engraver John Reich. The reverse shows Andrew Jackson (nicknamed Old Hickory) astride his horse. It was designed by Justin Kunz and sculpted by Don Everhart.